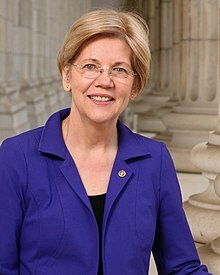 Elizabeth Warren (née Herring; born June 22, 1949) is the Senior United States Senator of Massachusetts since January 3, 2013. She is a progressive Democrat and a bankruptcy law expert. She was also an assistant to President Barack Obama. She supports student loan reform, banking reform, and consumer protection. Before she was a senator, Warren taught bankruptcy law at Harvard Law School. She interviewed hundreds of people who were going through bankruptcy or struggling to avoid bankruptcy. She gained a thorough understanding of the causes of bankruptcy and financial difficulties that families face in the United States. She wrote several books about these struggles, and about the institutions that make money by making it hard for people to escape from these difficulties. She and her daughter are the co-authors of a book called The Two-Income Trap. Warren has also written several other books, including A Fighting Chance and This Fight is Our Fight. In 2011, she created the Consumer Financial Protection Bureau, a government agency that protects consumers from unfair practices of banks, payday lenders, student loan providers, credit card companies, collection agencies, for-profit colleges and universities, and the collection departments of health maintenance organizations (HMOs). The Consumer Financial Protection Bureau was her idea. In 2014, the progressive wing of the Democratic Party tried to draft her for the Presidential nomination, but after several rejections from Warren, the progressive wing supported Bernie Sanders in the 2016 election. Warren is running for President in the 2020 election. ↑ Lee, MJ; Krieg, Gregory (December 31, 2018). "Elizabeth Warren launches exploratory committee ahead of likely 2020 presidential run". CNN. Retrieved December 31, 2018. ↑ Taylor, Jessica; Khalid, Asma (December 31, 2018). "'We Can Win': Elizabeth Warren Outlines 2020 Presidential Bid". NPR. Retrieved December 31, 2018. ↑ Reid J. Epstein (December 31, 2018). "Elizabeth Warren Launches Exploratory Committee for 2020 Presidential Bid". Wall Street Journal. Retrieved December 31, 2018. This page was last changed on 8 April 2019, at 18:05.